I edited a condensed version of just the queen rearing portion of this book so you can compare it to other methods. The table of contents has page numbers in case you wish to look them up in the original. The complete scan of the book is in available online at Cornell's "The Hive and the Honey Bee Collection". This chapter also published with other classic queen rearing books in the "Classic Queen Rearing Compendium"
TWENTY-TWO YEARS' EXPERIENCE QUEEN-REARING CONTAINING THE ONLY SCIENTIFIC AND PRACTICAL METHOD OF REARING QUEEN BEES, AND THE LATEST AND BEST METHODS FOR THE GENERAL MANAGEMENT OF THE APIARY. PUBLISHED BY THE AUTHOR. WENHAM, MASS. COPYRIGHT BY HENRY ALLEY, 1883. THE IMPORTANCE OF QUEEN-REARING AS A BRANCH OF APICULTURE. TWENTY-FIVE years ago I purchased my first colony of bees, and with that event began my interest in apiculture. My colony, being in a box hive, I transferred to frames, and commenced to rear queens and to experiment generally with bees. In the course of a few years, upon the introduction of the Italian bee to this country, there came a large and increasing demand for bees of this race. Many bee-keepers began to rear queens and to offer bees and supplies for the apiary for sale, a large number of whom soon failed for want of patronage, or were compelled to abandon the business on account of the cheap queen traffic. Of all who as late as ten years ago were engaged in this branch of the business, I can call to mind but one beside myself. Few have made queen-rearing and the supply trade a success. Shortly after the introduction of the Italian bee, the "American Bee Journal" sprang into existence, and simultaneous with its appearance began one of the most important industries of the age, viz. : practical apiculture. At this early stage of its history, queen-rearing was in its infancy, while but few bee-keepers had any practical knowledge of this interesting and vastly important branch of the business, and apparently very little advancement has been made up to the present time as compared with the other branches of apiculture. After a thorough examination of the latest works on the subject, and a careful study of all the various Bee Journals, I find only the old methods taught which were in use many years ago. Hence the beekeeping public continue to rear queens in the old way, the result being that a vast number of inferior and even worthless queens are put upon the market every season. 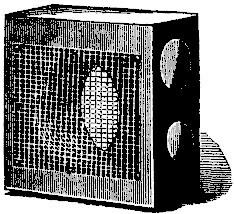 The present and future interests of apiculture demand a more thorough and practical method of rearing queens, and I shall endeavor in this work to give my readers such information as shall tend to give a new impetus to this branch of bee-keeping, and also aid, if possible, in doing away with the cheap and worthless queens produced under the lamp nursery system; and to offer to the bee-keeping public, for their careful consideration and adoption, a thorough, practical and scientific method of queen-rearing, which is the result of many long years of practical experience, and much hard study. In order to become a successful instructor one must first attain a complete knowledge of the subject to be taught, and unless it has been thoroughly and fully mastered in all its details, failures only can result. In presenting this work to the bee-keeping fraternity, I do not wish to assume the position of teacher, but rather to place before its readers in as plain and practical a manner as possible my method of rearing queens, leaving to their judgment the careful study, and candid criticism of its contents, feeling assured of a favorable decision regarding its merits and value; knowing that if its instructions are carefully studied in all their details, and put to a practical test, the result will be successful. By careful attention to all the rules laid down herein, I hope better queens will be produced, a matter of great importance to the bee-keeper whether he keeps bees for pleasure or profit; and of vastly more importance to the bee-master who follows it as a vocation and depends upon the same for a living. THE SELECTION AND CARE OF BREEDING QUEENS. All bee-masters know the importance of having a strong, vigorous and healthy queen for the mother bee; hence it will be admitted that all queens used for this purpose should be carefully selected, perfect in every respect, and of undoubted purity and prolificness. The particular strains from which we wish to breed should be thoroughly tested, to determine their qualities regarding purity, gentleness, honey-gathering, and wintering. This is very important and essential as some do not combine all the very desirable requisites above mentioned, and I would lay it down as a rule to breed only from such. THE ADVANTAGE OF USING SMALL HIVES AND COMBS FOR THE BREEDING QUEENS. If a large number of queens are to be reared, the mother queens should not be kept in full colonies, as the risk of killing them in securing eggs for cell-building is too great, and many valuable queens are lost in this way. To guard against such loss my breeding queens are kept in miniature hives (Fig. 1). The queen being more easily and speedily found on small combs, there is much less risk of injuring her, and there will be eggs enough in one of them at any time to start fifty or more cells. Fig. 1. Fertilizing or miniature hive. COMBS TO USE IN OBTAINING EGGS. In selecting the combs for the queen to lay in, to be used expressly for cell-building, take only such as are nearly new or that have been made use of for brood but once or twice. I do not use the combs in standard frames for this purpose, as in the course of the season a large number of nice brood-combs would be either badly mutilated or destroyed in so doing. Small pieces of comb the size of the nucleus frame, described in another place, are generally at hand and far preferable to larger combs. One standard Langstroth frame of comb will fill four or five of such small nucleus frames. It would be a good plan to fill frames with foundation, have it worked out in full colonies, and used for brood once or twice, then cut up and fastened into the small frames. I have found foundation very good for starting cells, even when it had not been used for brood at all; but care should be taken that the cells on both sides are drawn out to nearly the proper depth. These combs, when used to obtain eggs for cell-building, will be filled so that they can be removed as often as once every twenty-four hours. They should be properly numbered and dated for future use as wanted; the other four combs in the miniature hive being used for storing honey and brood to keep the colony prosperous in young bees. A good prolific queen will fill this small comb in. less than twenty-four hours, but it is better to let it remain that length of time. The advantage of using such small hives will be seen at a glance, as it will not be necessary to open a full colony every time eggs are needed from which to start cells. Again, the exact age of all eggs is easily and exactly determined, and the apiarist may tell at any time just when to prepare his bees for cell-building; the time when the queens will hatch from the cells may also be determined within a few hours. This is a matter of great importance; saving as it does, much time, labor and anxiety, as well as for other reasons which any intelligent bee-keeper will readily comprehend. THE DISADVANTAGE OF KEEPING BREEDING QUEENS IN FULL COLONIES. It may be convenient for those who wish to rear a few queens to open a full colony for eggs, but as they can seldom be found of the right age in sufficient quantities to start a large number of cells at any one time, the former plan is much to be preferred by large breeders. By placing a comb, selected for the purpose, in the centre of the brood-chamber of a full colony, we can sometimes find eggs which are suitable for the purpose, on the fourth day after, which should invariably be used on that day for cell-building. 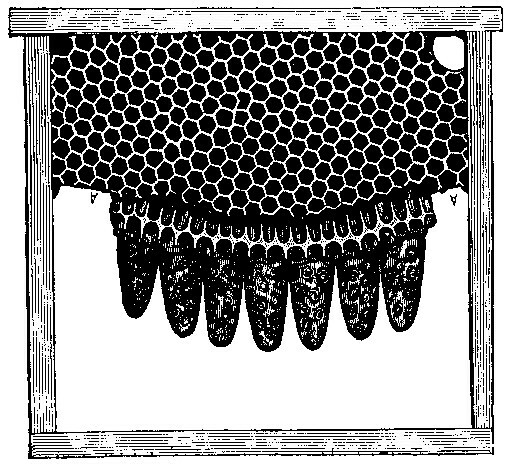 Sometimes the bees will not allow the queen to use such combs in which to deposit her eggs for several days, as perhaps breeding is not going on vigorously, and the queen may not reach the empty comb for one or two days after it is placed in the brood-chamber; consequently the hive would have to be opened often to ascertain this fact. Under such circumstances, queen-rearing cannot be carried on as systematically and successfully as by the miniature hive system. MINIATURE HIVES FOR BREEDING QUEENS. A colony in such a hive can always be depended upon for eggs at any time for cell-building. I find that a comb put in at night will be filled with eggs the next day. Then it may be removed and another inserted in its place. Once in twenty-four hours is often enough to change them. By this plan one queen will furnish eggs sufficient to rear 10,000 queens in the course of one season. The above plain and simple rules are the first steps which should be taken and put into practice systematically, if one wishes to rear first-class queens, and make the business successful and remunerative. ROOM FOR HANDLING BEES; WHAT COLONIES TO SELECT FOR CELL-BUILDING; HOW TO PREPARE THE BEES FOR THIS PURPOSE. Every bee-keeper should have a room specially adapted for the purpose of handling bees, as many of the operations about the apiary cannot at all times be carried on in the open air, especially in wet and cool weather. In fact, most of the work about preparing bees for cell-building can be performed only in a convenient and handy place. In view of this I have, in another place, given a description of such a room. Always select the strongest colonies for cell-building, and never the weak or feeble ones, as such would not rear strong and hardy queens. You may perchance have some strong colonies in the apiary, having queens which you wish to supersede; colonies having old, uneven or crooked combs; odd-sized frames, or those in box hives. These may be used to good advantage; thus ridding the apiary of such undesirable stocks, and should be selected in preference to those in good hives and in fine working condition. The combs can be transferred to other frames, and the brood given to weak colonies. 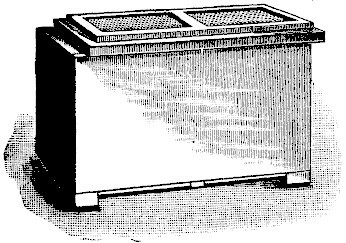 Having made your selection, take them into the bee room, give the bees a few puffs of smoke to cause them to fill with honey and remove the combs, examining them carefully to find the queen; after caging her, brush all the bees into a box, a Langstroth hive cap will answer every purpose. If the bees should attempt to crawl out blow a little tobacco smoke on them, and they will remain quiet. The bees should now be put into another box, say one that will hold three pecks, the top and bottom of which should be covered with wire cloth (Fig. 2, description farther on), in order to give the bees plenty of air. The top or cover of this box may be secured by Van Dusen clamps or some other simple arrangement. I use four screws for this purpose, but seldom fasten the top on unless the box is to be transported some distance. THE LENGTH OF TIME TO KEEP THE BEES QUEENLESS. The bees should be kept in this box at least ten hours. Soon after being put into it they will miss their queen, and keep up an uproar until released. This prepares them for cell-building. I find it a good plan to keep them in a cool, dark room, or cellar, until needed, as they will keep more quiet and there is less danger from suffocation. If the bees were properly drummed before being removed from the hive, they have filled themselves with honey sufficient to last during the time that they are kept confined in the box; but to guard against starvation, which might occur, as the bees do not in all such instances fill themselves readily, I give them a pint of syrup in the glass feeder (Fig. 8, described farther on). The bees must be kept queenless for from ten to twelve hours, else the eggs given them for cell-building will be destroyed. This I have learned from practical experience. ROYAL JELLY; HOW PREPARED; COMPOSITION OF. When eggs are given too soon after the bees are made queenless, they are very apt to remove or destroy them. This, however, is not the case when larvae are provided instead. I have had some experience in keeping pigeons as well as bees, and have noticed that there is a natural food or chyme (white, milky and very nourishing) secreted in the crop of the hen, with which to feed the young and tender birds during the early stage of their development. Reason and experience teach me that the same rule applies equally well to bees, and that when made queenless and confined in the swarming box they prepare or secrete the white, milky food, which we find in the bottoms of the cells around the eggs given them for rearing queens, and which is of the same nature as the royal jelly upon which the young queens feed while confined to the cell; also that it is necessary that they be kept queenless until instinct impels them to make this important preparation for cell-building. In support of the above I would say, first, that this secretion is found in all animal bodies (under certain circumstances) for this purpose; second, that the hen pigeon is incapable of secreting this food until about the fourteenth day of incubation, showing that the secretion is not made until needed, and lastly, the fact that bees, after being kept queenless ten or twelve hours, and then given the prepared eggs, will place this food in the bottom of the cells within an hour, going to work contentedly, knowing that they have means to produce other queens, and showing no further symptoms of queenlessness. Again, the amount of jelly-food furnished a larva from which a queen is to be reared is much greater than that from which a worker is produced, and the composition of each is entirely different. It may not be generally known that a colony deprived of its queen almost invariably selects a larva which is usually over twenty-four hours, and frequently from two to three days old, instead of an egg from which to rear another. Such queens must necessarily be "short-lived" as they are not reared in accordance with natural laws. Otherwise, so far as known, they follow nature. Every queen cell should be so abundantly supplied with royal jelly that after the queens have hatched there will be more or less left in the cells. This is the case with the best cells produced by the bees under the swarming impulse, and I claim that just as good cells can be produced by the method which I have instituted. Quite a distinguished writer made the statement some time ago in one of the bee journals that "artificial (or forced) queens left no jelly in the bottoms of the cells." He evidently jumped at this conclusion without thoroughly testing the matter. I admit that as artificial queens are generally reared, this will be the result, but when the reader has become thoroughly conversant with the directions given in this book, and has carefully put them into practice, he can produce those that show a goodly amount of jelly in the bottom of every cell from which a queen has hatched. Everything being now in readiness for cell-building, we go to the hive in which the breeding queen is kept and take from it the middle comb, placed there four days previous. We shall find in the bottom of the cells, if examined closely, a white, shiny substance. This is the just-hatched egg. Unless a powerful glass is used we shall be hardly able to see the small grub at this early stage of development. Fig. 3. Comb containing eggs. Fig. 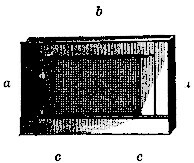 3 represents a piece of comb containing eggs, with lines running through each alternating row of cells, and showing the manner in which the comb should be stripped up for cell building. This piece of comb was also photographed, and is about one-half the natural size. We now take this comb into the bee-room which has been warmed to prevent the eggs from being chilled. Cut it into strips with a thin, sharp knife (an old-fashioned table knife ground thin answers the purpose), running the knife through each alternate row of cells as seen in Fig. 3.1 After the comb has been cut up, lay the strips flat upon a board or table, and cut the cells on one side down to within one-fourth of an inch of the foundation or septum, as seen in Fig. 4 A very thin, sharp and warm knife must be used, or the cells will be badly jammed and mangled. While engaged in this work I keep a lighted lamp near at hand with which to heat the knife, as a delicate operation of this kind cannot be performed well with a cold tool, nor so quickly. Fig. 4. Strip of comb on which cells are to be built. Fig. 4 represents a sectional view of one of the prepared strips as cut from fig. 3, and ready to place in position for cell-building. HOW TO HAVE CELLS BUILT IN ROWS; THE NEW METHOD. Now we come to a process which I have for many years been trying to effect, and its discovery has proved invaluable to me. In truth, I would have paid one hundred dollars at any time during the first sixteen years of my experience for a knowledge of this fact. I never was troubled in getting all the cells which I needed built in the old way, but to have them so evenly spaced that each could be cut out without injuring or destroying its neighboring cell, puzzled me for many years; by persistent thought, persevering labor and experiment, however, the matter was at last settled satisfactorily. This one fact alone is worth one hundred dollars to any queen-dealer, and ten times the cost of this book to any bee-keeper, even though they rear but few queens; and I feel assured that all my readers will admit this when they have tested it. HOW TO PREPARE THE COMB FOR THE QUEEN CELLS. The strips of comb being all ready, we simply destroy each alternate grub or egg, as seen in Fig. 5 In order to do this, take the-strips carefully in the left hand and insert with the right the brimstone end of a common lucifer match into each alternate cell, pressing gently until it touches the bottom, and then twirl it rapidly between the thumb and finger; by this means the egg or grub will be destroyed. This gives plenty of room for large cells to be built, and the bees to work around them and also permits of their being cut out without injury to adjoining cells, Fig. 6 (a full description of which is given elsewhere). Fig. 5. Comb containing eggs in alternate cells. Fig. 5 represents the prepared strips with the egg removed from each alternate cell. Fig. 6. The new way of having cells built. Fig. 6. This cut represents one of the frames used in my fertilizing hives, one-half of the comb being cut out to make room for the queen-cells. A A represents the strip of comb containing the eggs (on which the cells are built) fastened to the comb. The frame was photographed (as shown in cut) smaller than its natural size. The cells are exactly as the bees build them by my new method. All queen-dealers know that this cannot be done when the cells are built by the old method as shown in Fig. 7. I think I hear some "doubting Thomas" say, How will you place or secure this slender strip of comb in a frame so as to prevent its falling down? I would reply, have at hand a sheet iron pan about six inches (15cm) long, three inches (8cm) wide, and three inches (8cm) deep, being rather larger at the top than bottom (or any other sort of iron vessel that will hold hot beeswax and rosin) and so arranged that you can place a lamp under it to heat it. Keep in this pan a mixture of two parts rosin and one part beeswax. Heat this enough to work well, being very careful not to overheat it, as it will destroy the eggs in the cells if used too hot, and if too cold it will not adhere properly; the right degree of heat will soon be learned by practice. I keep on hand a number of frames of comb which are free from brood or eggs, into which the prepared strips A A are fastened, as shown in Fig. 6, page 15. You will notice that this comb is cut with a slightly convex curve. By putting the prepared strips in after this manner, still more room is given to each cell owing to the spreading caused thereby. Fig. 7. The old way of having cells built. Fig. 7 represents a cluster of cells built by the old method; a piece of comb containing eggs was inserted and as none of the eggs were destroyed the bees built cells in clusters as shown, by this cut. The cluster shows five cells three of which may be saved by transferring. HOW TO FASTEN THE PREPARED STRIPS IN POSITION. To fasten these strips, dip the edge which has not been cut into the preparation previously mentioned, and immediately place it in position, so that the mouths of the cells point downward, pressing it with the fingers gently into place, taking care not to crush or injure the cells in so doing. A number of such combs, say eight or ten, and more if necessary, should be kept on hand for this purpose and used as often as cells are needed. This is a great convenience and saves destroying or mutilating other combs. When the cells are cut out, the strip on which they are built should be taken with them. HOW TO RELEASE THE BEES FROM THE SWARMING BOX. Everything is now ready for the queenless bees in the box, impatient to be released and anxious to commence cell-building. This box has a strip of tin nailed on the upper edge of one end flush with the outside; the cover has a similar strip nailed on the under side, which corresponds with the one on the box when in place, Fig. 2. (See description at end of volume). The combs containing the brood prepared for cell-building are now placed in the nucleus hive with other combs sufficient to fill it. 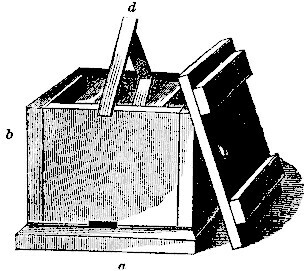 Place this nucleus on the stand from which the bees were taken, and at such an elevation that the bottom edge of the alighting board will come just even with the top of the box in which the bees are confined. Next let the bees out by drawing the cover back just enough to allow the worker bees to pass between the strips of tin into the hive. HOW TO SEPARATE THE DRONES FROM THE BEES. If there are drones with the bees either black or otherwise objectionable, they will be retained in the box and can be easily destroyed, after the bees have all left. In case the drones are needed (or if there are none with the bees which is often the case), all may be turned out in front of the nucleus, when they will soon run in; this being on the old stand they will accept it as their home and begin cell-building at once from the eggs given them. In no case should any worker brood be given to the bees, thus compelling them to concentrate their whole forces on cell-building. Some capped drone-brood should be given them, if at hand, as it would greatly encourage the bees, and is really an advantage. WHEN TO PREPARE THE BEES FOR CELL-BUILDING. I usually prepare the bees in the morning for queen-rearing, and give them the eggs at night. By the next morning they will usually become reconciled to the new state of things and from twenty to twenty-five queen cells will be started; this of course depends upon the number of eggs given them. Just here let me caution all queen-breeders against giving the bees too many eggs, or allowing them to build too many cells at one time. If not permitted to complete over twelve cells, the queens will be found as good as, if not superior to, those reared under the swarming impulse. If you wish to rear queens of which you and your customers will be proud, you will find the secret is in not allowing any colony to build more than this number. If this precaution is taken, good queens will be the rule and not the exception. Of course, to accomplish this your breeding queens must in all cases be as near perfect as possible, other things being equal. We seldom find more than twelve first-class cells, and often a less number, in a colony which has just cast a swarm, the Cyprians and Holy lands being exceptions. The queens of these races are very prolific and hardy, consequently they rear a much larger number. Now we have everything in good order and condition, and cell-building is progressing satisfactorily, except perhaps too many cells are being built for the quantity of bees in the colony. If such be the case, and it does sometimes so happen, all over twelve or fifteen should be destroyed. This may be done by means of a match, as before stated. Sometimes, in the hurry of preparation, an egg is passed by and not destroyed, but if the work in the first place is properly and thoroughly done no trouble of this kind need be apprehended. FEED WHEN FORAGE IS SCARCE. Fig. 8. Fruit jar feeder. If the honey harvest is abundant during the period of cell-building little care is needed until the cells are about ready to be cut out, but if not the nuclei will need liberal feeding (say one pint of syrup each night and morning) to stimulate them properly. In such cases, feeding should certainly be resorted to or inferior queens will be the result. For this purpose I never have seen a feeder so convenient and so good as one constructed as follows: take either a quart or pint improved Mason's fruit jar, Fig. 8, remove the glass top and substitute a tin one in its place, cutting the tin the exact size of the glass top and punch about twenty small holes therein for the food to pass through. Bore an inch and a half hole in the cover of the nucleus, and place the jar bottom upward over it. There should be a space of one-half an inch between the jar and the top of the frames so that the bees can get at the food readily. The bees will take a pint of food in the course of two or three hours, if there are twenty or more holes for it to pass through. For slow feeding make about six holes. If honey is scarce, use granulated sugar and water, say five pints of water to six pounds of sugar, and mix either hot or cold; make a fairly thick syrup. When thoroughly dissolved, flavor with a little pure honey. Do not use glucose or grape sugar under any consideration. WHAT TO DO WITH SURPLUS QUEEN-CELLS. At this point we will consider that the bees have been at work four days on the cells, and that they are sealed over or nearly so. If desirable they may be left seven days longer where they are, and then cut out and either placed in nuclei or put in the queen nursery to hatch. Where queens are reared on a large scale, the combs containing the cells just sealed may be taken from a number of nucleus colonies and given to one, as one colony can take care of one hundred cells as well as a smaller number. Care should be taken to have a colony on hand prepared to care for such surplus cells until it is safe to remove or cut them out. It will be necessary to give such colony a frame of brood occasionally, to keep it well stocked with bees. These combs should be examined at least once a week in order that no queen-cells are built, as a queen might hatch out some day very unexpectedly and destroy all the cells in the hire. You will remember that each frame containing cells has the number of the breeding queen and the date of starting the cells marked on the top. If proper care is taken to keep a correct record of this in a day book kept for the purpose, you will know exactly when the cells are ready to hatch and the time they should be transferred to nuclei or to the nursery. When the cells are sufficiently matured to be safely removed from the nuclei, cut them out, taking with them the strip of comb on which they were built. They should be immediately taken into a warm room and separated. A lighted lamp is kept at hand with which to warm the knife. Occasionally a small piece of one of the cells is shaved off. The fracture thus made may be easily repaired by placing a small piece of foundation over it, plastering it on, having the knife quite warm, being very careful to make sound work of it or the bees will reopen the cavity and remove the nearly matured queen. After this is done place the cells in the nursery or nuclei. We will suppose that we have one hundred queen-cells on hand and one hundred nuclei ready to receive them. When the cells have been sealed seven days they may be safely cut out, but it is better to let them remain until the morning of the eighth day after they were sealed, and then give them to the nuclei. Of course, cells are being built in other hives and will soon hatch. 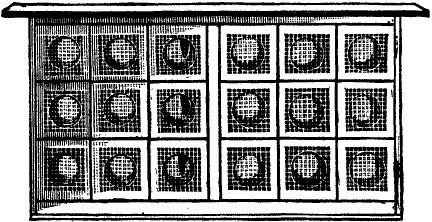 The first lot of queens should be fertilized by this time, and disposed of, if the weather has been favorable, and room made for a second lot; but supposing the first lot not to have been fertilized on account of unfavorable weather, and there is not room for the second lot in the nuclei already in operation, what shall we do with them? No queen-dealer can afford to lose a fine lot of cells, especially if he has a large number of orders on hand; every cell and perfect queen must be preserved in some way. How can this be accomplished? I will give my method which is a simple and good one. I provide against such a contingency by having a queen nursery of my own invention, Fig. 9. QUEEN NURSERY AND HOW TO USE IT. I use eighteen cages in one standard Langstroth frame; each cage, Fig. 10, has a place in it for a sponge to contain the food, and another for the cell. An inch and one-half hole is made in each cage, both sides of which are covered with wire-cloth. Each cage is provided with food sufficient to last a queen one week. The cells are cut out and placed in these cages which are then placed in the centre of a full colony. As eighteen of these just fill a frame they will stay in place without any fastening whatever. A bungling workman cannot make them so that they will work just right. The cages must be exactly alike, and then there will be no trouble in having them stay in place. They should be cut out with a circular saw run by steam power. I make it a point to do all such work in the best manner possible. By the use of this nursery, my queens are all hatched in the brood-chamber and in nearly the natural way, and by the natural warmth of the bees; no lamp nursery nor other artificial devices being used, and none of which ever should be used in queen-rearing. When one digresses from the paths of nature, in this business, the more unsuccessful he will be. When the queens are in the nursery in the centre of the brood-chamber, they are perfectly happy and contented, and will live there safely for several weeks. In no other way have I been able to preserve them so long. Each cage must be supplied with food, as a colony with a laying queen will not feed virgin queens, and oftentimes even a queenless colony cannot be depended upon for doing so, as I have learned to my sorrow. INTRODUCING VIRGIN QUEENS; HOW LONG TO KEEP A COLONY QUEENLESS BEFORE INTRODUCING A QUEEN. This is another important point which properly comes under the head of queen-rearing. It has been said that virgin queens cannot be successfully introduced. Those who assume this certainly mistake. I am obliged to introduce hundreds of them every year, and have no trouble in so doing. I seldom have occasion to introduce them to full colonies, but that it can be safely performed I have no doubt. In order to introduce such queens successfully the colony should remain queenless three days (seventy-two hours); then give them a pretty good fumigating with tobacco smoke. Remember, the bees must remain queenless three days at the least, and during the meantime no queen must be near them, otherwise the operation will prove a failure. Virgin queens can also be introduced successfully by daubing them with honey and using no tobacco smoke. Put a little honey into a tea-cup and roll the queen in it so as to daub her thoroughly, then drop her from a spoon into the hive among the bees. They will at once commence to remove the honey and when they have done so the queen is safely introduced. This is a much slower process than by fumigating them with tobacco smoke, but quite as successful. Do this just before sunset. When tobacco smoke is used to introduce them, throw some grass against the entrance to keep the smoke in and the bees from coming out. Blow in a liberal amount and then let the queen run in at the top through the hole used for the feeder. ANOTHER WAY TO INTRODUCE VIRGIN QUEENS. Make a cage wholly of wire-cloth or such an one as is used in mailing queens. Cut a mortise from the main apartment to the outer edge as seen in Fig. 11, cage the queen and fill the mortise with Good's food; by the time that the bees have removed it, they will have become acquainted with the queen. Bear in mind that the bees must be queenless three days before introducing virgin queens just a little tobacco smoke is used to scent the bees at the time the cage is put in, I think the undertaking will be rather more successful. Laying queens can be introduced by the same process. A colony made queenless for the purpose will always begin to rear a number of cells. When the new queen is introduced, they immediately stop cell-building; all are destroyed, and the bees commence to pay royalty to the new queen given them. THE OLD AND NEW METHODS OF CELL-BUILDING. I presume the reader has followed the descriptions carefully and understands now how to have queen-cells uniformly built, so that none need be destroyed in cutting them out. By the old method a large number of fine cells must necessarily be destroyed in transferring them, as they are built so irregular and oftentimes so close together that three or four are rendered useless. It is also exceedingly difficult to determine when the cells will hatch, as the bees will use eggs or larvae in various stages from which to rear queens. Again the bees will continue to start cells three or four days after the brood is given them. My method does away with all this trouble, and we can determine to a certainty, within a few hours at least, the time when the cells will hatch. This is one of the great advantages to be derived from its use, and again, there is no guesswork about it, and no eight or ten day queens need be anticipated as none can be reared, simply because there are no old larvae for them from which to rear queens. HOW TO REAR QUEENS IN FULL COLONIES AND STILL HAVE NONE QUEENLESS. I have asserted that my queens are reared in full colonies and none are ever queenless. Well, none of my standard colonies are ever without queens. I first determine as nearly as possible the number of queens I intend to rear during the season, and then select enough good strong stocks for the purpose. One half-dozen colonies will rear a large number of queens in a season, as will be seen by what follows. I deprive the first half-dozen colonies used for queen-rearing of all their brood and queens, giving the former to weak colonies to build them up, as by this process I can soon make them strong. I prepare as many colonies in this way as I wish to keep building cells at one time and as I think will meet my wants for one season. I would state here that no colony should be permitted to build two lots of cells; I mean by this that the first lot of cells should not be removed and eggs given them to build others. I consider it poor policy to do so, although such a colony will build a second lot of cells; but they would produce inferior and almost worthless queens, and a queen-dealer who would do so would soon lose his reputation. HOW TO OBTAIN MORE CELLS. When I want a fresh lot of cells, I take a strong colony and remove all the bees, by the process described on page 8. Replace the combs, and put the hive exactly where one of the colonies has been standing which has just finished a lot of cells. Then brush or shake the bees from the combs of the latter hive (care being taken not to shake the comb on which the queen-cells are built), in front of the hive from which the strong colony has just been taken, and give them the queen from the first colony. Bees enough should be left with the cells to keep them from chilling, or the frame on which they are built can be placed in a hive where other cells are being built, or add one frame of honey and one of brood, and form a three-frame nucleus. When the cells are ready to hatch, transfer all but one to other nuclei, and thus gradually form the needed nuclei for the season. HOW OFTEN THE SAME COLONY MAY BE USED FOR CELL-BUILDING. Having taken care of the cells and brood in the full colony, we now have a fresh lot of bees on our hands, which will be ready in a few hours to build other cells, while the bees which have just completed the first lot will continue the work in the hive from which the fresh bees were taken. In three or four weeks the same process can be repeated, as the old hive will then be full of newly hatched young bees. After getting bees enough to start the first half dozen lots of cells, no more hives need be made queenless and every colony will be kept strong during the season, as they will have a laying queen all the time. It will be seen by any intelligent bee-keeper that it will not require half as many colonies to rear one thousand queens, as by the old process. This I also claim as original. DESTROYING DRONE BROOD AND WORTHLESS DRONES; THE USE OF THE DRONE TRAP. Where the extractor is used drone-brood not needed may be destroyed after the honey has been slung out, by uncapping it, being careful to shave off the heads of the drones; for this purpose I use a thin, flat knife such as Mr. Peabody sold with his extractor. Excessive drone-breeding can be kept down by such a process, when there are only a few hives kept. I cannot recommend this process in a large apiary and some other device must be resorted to. Most any one, I think, has sufficient ingenuity to construct a drone trap for the purpose of destroying worthless or surplus drones, I find it rather difficult to describe one so that all may understand it, but shall have an engraving made and give a description of it at some future time. All that is needed is to place a gauge at the entrance so that the drones cannot get out, and make an outlet for them to pass through into a box from which the workers can escape and they cannot. 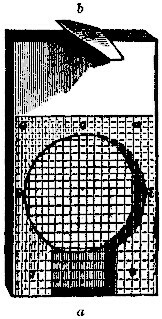 The swarming box, only on a smaller scale (of which a description is given at end of volume), will answer every purpose. Care must be taken, if a trap is used, not to smother the colony; this will not be the case if the bees have an easy means of escape from the hive into the trap. The outlet for the drones to pass into it must be made large enough for them to pass through freely. HOW MANY QUEENS OUGHT A COLONY TO REAR? I have frequently cautioned queen-dealers and those who rear queens simply for their own use, against rearing too many queens in one hive at the same time. This is so very important that I must be excused for repeating it. By my plan one hundred queens can be raised by a colony as well as twenty-five; but the more queens reared the poorer they will be. The correct number, as my experience teaches me, is about twelve queens to a colony. I have found that worthless queens are reared under the swarming impulse as well as by artificial means. If a queen is removed from a full colony they will build from twelve to twenty queen-cells. Very few of these will prove to be valuable queens, as a colony thus made queenless will not start cells from the eggs. They will select larvae two or three days old for cells as their impatience leads them to diverge from nature's course every time. The queens reared from the latter cells always prove shortlived and almost worthless. I am aware that a large number of the queens reared are produced by the latter process. This statement is founded on the writings of many who rear queens. HOW TO REAR VALUABLE QUEENS. To rear valuable queens, I think the hive should not contain over twenty-five eggs to start with, and in about twenty-four hours after the cells are started, at least ten of them should be destroyed, so that not over fifteen remain to mature. Of course we cannot afford to sell such queens for seventy-five cents or one dollar each. Out of twelve cells that hatch, probably four of that number would never mature or they would be destroyed in some other way: lost in mating, killed in the hive, or by some other mishap to which queens are always liable and exposed. HIVE TO USE FOR YOUNG QUEENS. For many years I have used the small hive described on page 4, for queen nuclei (for fertilization only), and find them as convenient and handy as any. They are made large enough to take four combs, but I seldom use over three to each hive. Many large queen-dealers use the same kind for this purpose, and find them just as good as larger ones, much handier and less expensive. In the fall the bees are united with other colonies, and the combs packed away in barrels for use another year. To prepare these hives for the cells, or young queens, I proceed as follows: if a box-hive is to be broken up, with which to fill them, it is taken into the bee-room. The bees are treated the same as though, they were in a frame-hive, viz. : induce the bees to fill themselves with honey by closing the entrance, smoking them, and rapping smartly on the hive for ten minutes or more. After driving all the bees out that can be induced to leave the hive, proceed the same as in transferring, placing the bees in the cap of a hive or box until ready to be placed in the nuclei. Fig. 12. Screen used for purpose I use a small screen to ventilation. Put the comb containing brood and that containing honey into the small frames. Give each hive at least one frame of brood, one of honey and one empty comb. Place two of the frames in the hive then put in about one pint of bees, putting the third comb in last, then place the cover on. Confine the bees in the hive forty-eight hours before permitting them to fly. If there are but few drones in the hives and we wish to destroy them, it can be quickly and easily done by the following plan: go to each of them early in the morning of the day on which they are to be liberated, take an empty hive with you, give the bees a small dose of tobacco smoke, let them remain quiet a few moments then examine the combs separately and very carefully, and pinch the head of every drone found. Put the combs with the adhering bees into the empty hive, placing it on the stand of the hive just examined. The bees must have plenty of air while confined in these small hives. For this nail on the front of each, Fig. 12. It should be made roomy enough so that the bees can come out from the body of the hive into it, and get all the air they need and return as often as they choose. WHERE TO PLACE NUCLEUS HIVES. Nuclei used for fertilizing queens should not be placed very near colonies building cells, as the queens, when returning from the marriage tour, are quite liable under such circumstances to enter the wrong hive, and young queens, even though not fertilized, are always welcome to a queenless colony. Nuclei for fertilizing queens should not remain queenless long at a time; if they do there is great danger of fertile workers gaining possession of the colony and they are the pests of the apiary. I have seen many valuable queens destroyed by them. WHY BEES BALL AND DESTROY QUEENS. When queens have returned from the flight in search of drones they are sometimes seized by the bees, hugged or smothered to death (called balling), stung or injured, wings torn, or one leg stung and rendered useless. In almost every instance where this hugging takes place the queens are nearly ruined, this being more than they can endure without injury to their fertility. When this takes place one may know that fertile workers infest the colony. Having everything properly prepared we are ready to give to each nucleus a queen-cell. This can be done without taking out the combs or cutting them, as is the general method practised by most queen-dealers, and given by the bee journals as the best. I generally find plenty of room between the combs without disturbing any of them. If not, I slip one of the frames a little to one side, place the cell in position point down ward, of course, and gently press the comb back against it. It will thus be held securely in place and will hatch as well as though inserted in the centre of the comb. By doing this, the combs are not mutilated and the operation is quickly performed. If young queens are to be given to the nuclei instead of cells, proceed according to directions given on page 25. Bear in mind that very young queens are more acceptable than those four or five days old. It is much more troublesome and more difficult to introduce older ones, and the latter will be destroyed unless scented by being fumigated with tobacco smoke or by some other means, the idea being to deceive the bees, which can be done by scenting them all alike. A queen-cell can be given to a colony immediately after removing a queen from it, and should the young queen emerge from the cell within an hour she will generally be kindly received, and thus safely introduced. Occasionally, a queen hatching so soon after the cell has been introduced will be killed, but this seldom happens. Cells may be given to queenless colonies at any time, but queens should not be given to any colony until it has been queenless three or more days. THE AGE AT WHICH QUEENS ARE FERTILIZED. We read quite frequently in the bee journals of queens becoming fertilized when only three days old. This may be true, but in all my experience, I never knew one to take her wedding flight when less than five days old. In from thirty-six to forty-eight hours after this they usually commence to lay. Early in the season they generally come out, between the hours of one and three P.M., and sometimes as late as four P.M. After the first of September they will fly as early as 11.30 A.M., and not much later than two P.M. unless the weather is very warm and pleasant. HOW TO FORCE THE DOTING QUEENS TO FLY. In localities where forage is scarce, some means must be adopted to stimulate the bees and cause the queens to fly when they are not disposed to do so. This can be accomplished by feeding the bees. The nucleus feeder Fig. 13, which I have used for twenty years, will hold one ounce of syrup and is admirably adapted for this purpose. Such colonies as have queens old enough to fly are fed during the forenoon and the queens will fly in the afternoon and generally be fertilized; whereas if they are not fed they will not leave the hives sometimes until a week later. QUEENS FERTILIZED BUT ONCE; HOW FAR TO KEEP THE RACES APART TO INSURE PURITY. I am satisfied that no queens are fertilized more than once. They may fly more than once, but if they make the second flight and bear all the indications of having met a drone, it is pretty certain that they were unsuccessful the first time. There are some who entertain the idea that a race of bees cannot be kept pure unless they are kept isolated several miles from all other races. I have tested this matter carefully and pretty thoroughly during the last twenty years, and have found that one-half mile is as good as a much greater distance. While drones will sometimes fly a mile or more, the queens will not. This fact can be ascertained by watching a queen when she takes her wedding flight. She seldom is gone over five minutes and nine out of every ten will return within five minutes. Of course if the young queens are only one-half mile from a large apiary of black bees, there must be an abundance of Italian drones in the same yard with them. This being the case not one queen in twenty-five will mismate. This rule applies equally well to all races. HOW TO KEEP LAYING QUEENS. Sometimes queen-dealers and often other apiarists have occasion to keep laying queens on hand several days before using them. Surplus queens can be kept on hand a long time, in the queen nursery, provided the cages are well supplied with food; this being the only attention needed. The sponges in the cages must be refilled with honey as often as once each week at the least. The nursery should be placed in the centre of the brood-chamber of a full colony. To make room for it either remove one of the outside combs, or, in case the colony is strong, one of hatching brood. The latter may be given to some weak stock. When the nursery is taken from the hive and no other queens are at hand, fill the space then left vacant either with an empty comb or a frame filled with foundation. A few queens may be kept by placing the cages between the cushion and frames, in such a manner that the bees will have easy access to them. A colony having a fertile queen cannot be depended upon to feed other queens under such circumstances, hence the importance of supplying the cages with food. A person must use his judgment regarding keeping queens in this way, when the nights are cool. There need be no apprehension regarding this point between June 1 and Sept. 1. FEEDING NUCLEI; WHY THEY SOMETIMES SWARM OUT. Nucleus colonies (in hives, described at end of volume), must be fed as often as once each week, unless forage is abundant, or they will "swarm out," even when they are well supplied with brood and honey, as such colonies are easily discouraged. They will not do so if fed a small amount of syrup occasionally. Use only the best sugar-syrup (not honey), giving it to the bees the same day on which it is prepared. Never use poor food as it soon sours, and runs out of the feeder besmearing the bees and combs. This will surely cause them to desert the hives. The following incident well illustrates this point: one morning I fed fifty nuclei with some syrup which had been prepared but twenty-four hours. The weather was very warm; the syrup became sour and ran out of the feeder besmearing the bees and combs, every colony of which swarmed out and united in one cluster. This resulted in a loss of nearly fifty dollars to me. I have found that many of the young queens from some mothers are lost on their " marital tour," although such queens when successfully mated prove very valuable. This is a singular and unnatural phenomenon for which I cannot account. Why they fail to return to the hive is more than I can comprehend. Queens having this imperfection should be discarded as breeding queens at once, notwithstanding they may in many other respects be very desirable as queen mothers. We cannot afford to use queens of this class from which to breed others, when so many of their young queens are lost in mating. It is rather discouraging when examining a lot of nucleus colonies, where there should be a number of fine laying queens, to find none, they having been lost while on their first flight. I bred from a queen last season not one in fifty of whose royal daughters was lost in mating. These are the only profitable ones from which to breed. For breeding queens select carefully only those which are very prolific; whose royal progeny are fair in size and handsome, whose worker bees are uniformly marked, gentle, good workers, and perfect in all other respects. Purity of stock cannot be maintained unless great care is taken in selecting the queen mother. Never use one whose workers have from one to three bands. The young queens from such an one would show a variety of markings, black, striped, and a beautiful yellow, the yellow ones being sadly in the minority. If beauty, purity and business qualities are desired, such a queen would be worthless. Always select one having the markings which show her to be pure, prolific and hardy. This subject is more fully explained elsewhere. THE SELECTION OF THE DRONE MOTHER. I have long contended that success in queen-rearing depends largely upon the drones used for mating. The same care should be taken in the selection of the drone mother as with the queen mother. Her worker bees should be well-marked, gentle, good honey-gatherers, hardy, and absolutely pure; the drones large, handsome, and very active. I never permit drones from all my colonies to fly promiscuously, or have any haphazard mating of queens. Only selected drones having the above-mentioned qualities are tolerated in my fertilizing apiaries. HOW TO REAR AND PRESERVE DRONES. It is well known to most bee-keepers that colonies having fertile queens will neither rear nor permit drones to live in the hive late in the season, and seldom when forage is scarce. If queen-rearing is going on, drones must be procured at any cost, and some means must be adopted to rear and preserve them for use in the latter part of the season. To do this I pursue the following method: have at hand several extra frames of drone comb; insert one in the centre of the colony from whose queen you wish to rear them. Feed this colony liberally if forage is scarce. Examine them in the course of a week; if the comb is well filled with eggs and larvae remove it to a queenless colony. Instinct teaches queenless bees the necessity of rearing and caring for drones, hence they can always be depended upon for them provided the brood is given them. Replace the comb just removed with an empty one; continue this as long as the queen can be induced to lay drone eggs. Remember that queenless bees never destroy drones, while a colony having a fertile queen will invariably do so, unless encouraged to preserve them by being fed. It is a very difficult matter here in the north to induce queens to lay drone eggs in September, even when forage is abundant; hence drones to be used in September and October should be secured in the early part of August, as most colonies seem disposed to rear them at this time. HOW TO JUDGE OF A QUEEN BEFORE TESTING. The practised eye of an expert in any vocation can detect imperfection where the novice cannot. My experience enables me to judge of the qualities of a queen; whether she will prove prolific or otherwise, as soon as she has laid several hundred eggs. The laying queen, if a good one, will deposit all her eggs in the cells in exactly the same position. Every egg will point downward, and will be large and plump when compared with those of an unprolific one, and every cell not otherwise occupied will contain an egg. I can also determine whether a queen is worth preserving or not the moment she leaves the cell. An inferior queen in gnawing through leaves a little ragged hole instead of cutting a large clean cap, Fig. 14, and leaving an opening nearly large enough to admit the end of the little finger, as a strong and well developed queen always does. It is worse than useless to preserve such queens. Fig. 14. Cell from a strong queen hatched. DESTROY WEAK AND FEEBLE QUEENS. After the cells in the nucleus or those in the nursery are hatched, examine the outlet to each, and if small and ragged destroy the queens at once. A good prolific queen will lay nearly or quite four thousand eggs in twenty-four hours. One that will not do this is not worth preserving. I never saw a queen that I considered too prolific for my own use (the opinions of some others to the contrary notwithstanding). I want queens that will deposit ten thousand eggs or even more in a day if they can be reared. Very few bee-keepers are troubled with queens being too prolific. I should as soon find fault with my hens for laying two eggs per day when eggs are worth forty cents per dozen, as with a too prolific queen when honey is worth twenty cents per pound. I am aware that hens do not eat the eggs after laying them as the bees do the honey after gathering it; but if the hens laid no eggs there would be no profit, and if a queen is not prolific there is no income from that source. The main object in rearing queens is to get hardy and prolific ones, the more prolific the better. A queen that will lay five thousand eggs in a day is worth one hundred that will lay but one thousand in the same time. My opinion is founded on experience and the result of careful experimenting, and I believe that a large majority of bee-keepers and those of extended experience are of the same opinion. I find customers occasionally who want large queens. A person engaged extensively in queen-rearing will have them of most every size. I must confess that I like the appearance of large and handsome queens; but they do not as a rule prove to be the most prolific or profitable. Queens of medium size are generally the best. They have proven so with me. Good queens are those that keep their hives well filled with bees. The color or size has no effect on their fertility. An experienced bee-master can judge of the quality of the queens which he is rearing even before they leave the cell. If the cells are short and blunt when just sealed they should be destroyed at once, rather than wait and destroy the queens after they have hatched, as such queens would prove worthless. The cells containing good queens are long and pointed, and heavily waxed with a rough surface. The bees when constructing the cells seem to understand the condition of the embryo queen, and whether she will be strong and vigorous or otherwise. Cells having the blunt point and thin walls, so thin in fact that the young queen can be seen through them, generally contain very poor ones. Queens that delay long before becoming fertile in favorable weather will not prove of first quality. A smart, active queen will invariably leave the hive on her wedding trip when she is five days old, and in all my experience I never knew one to become fertile at a younger age. A person rearing queens extensively, and keeping several races of bees in his apiaries, should note those that build the largest and finest cells, and rear the best queens. The Holyland bees will build a large number of cells if permitted to do so, and the queens reared by them are very large and prolific. All things considered, I believe them to be the best of the four races for cell-building. The Cyprians come next in value for this purpose; there is, however, little difference between these. My acquaintance with the Cyprian and Holylands, however, has not been as extensive as with the Italian and black bees, and I will give my experience regarding Italians, as it may differ from that of others. THE ITALIANS NOT A DISTINCT RACE. The fact that the Italians are not a distinct race is well established and generally admitted; hence it becomes necessary, in view of this, to propagate the other races in order to keep the former up to the standard and maintain their established reputation as a superior race. I have tested the different races and find that the Italians are the least adapted for cell-building. I do not understand why this is so. Prior to the introduction of the Cyprians and Holylands, I always gave the black bees the preference as nurses, whenever I could procure them. The cells built by the Italians are small, many being similar to those described on page 45. I would not hesitate for a moment to destroy them as soon as sealed. It would be folly to permit queens from such cells to become fertile, as they would prove worthless, and much valuable time would be lost in testing them. Distinctly remember that rearing queens artificially is quite a different process from that pursued by the bees when allowed to follow their natural instincts. The Creator has instituted perfect laws governing insects, and bees comply with the requirements of these laws when allowed to rear queens in the natural way; the result being perfect queens. In view of this and on account of the increasing demand for queen-bees, it becomes necessary to adopt some artificial means by which equally as good queens can be produced. In all my experimenting with bees for this purpose, I have imitated nature as perfectly as possible. REARING QUEENS FROM THE EGG. Most intelligent and experienced bee-masters agree with me in the opinion that queens should be reared from the egg, as, other things being equal, they prove the best in all cases. I formed this opinion during my first year in the business, have had no reason to change it, and claim that this is the only way to rear queens which will compare favorably with those produced in the natural way under the swarming impulse. Many years ago, I frequently heard an old beekeeping friend make the following remark: " If you want large queens start them from the egg." Anyone can satisfy himself of this fact by thoroughly testing it for a few weeks. Full directions for procuring and keeping a continuous supply of eggs for this purpose may be found on page 4, which should be carefully followed in order that you may be prepared to start cells at any time. THE PROPER TIME TO COMMENCE QUEEN-REARING. I make it a point to have the hives well stocked with bees and in a proper condition to swarm, having sealed drone-brood before I start my first lot of cells. Here in New England, in favorable seasons, queen-rearing may be commenced the first week in May provided the bees are properly stimulated. It is well understood that natural cell-building depends upon the following conditions, viz. : strong and populous colonies, a good supply of drone-brood and young drones, vigorous queens, warm and genial weather, and a plentiful flow of honey. Hence, you will see the necessity of stimulating the bees for early breeding by giving them a liberal supply of syrup, and in every other possible way. I consider the above the best indications of their readiness to commence cell-building. THE NEW WAY VERSUS THE OLD. I wish to point out some of the advantages which the new method has over the old. The latter having been fully described in the various bee journals and standard works on apiculture, the reader must necessarily be familiar with them. The first point is to make a colony queenless. A few hours later, give it a comb containing eggs and larvae (either with or without holes cut in it), permitting the bees to build the cells where they choose. They generally build them in clusters (see Fig. 7), and so closely joined that they cannot be separated without destroying many of them. The eggs given vary in age from one to three days, consequently when the queens commence to hatch, it will be from one to three days before they have all left the cells; and when a larva three days old is selected, the queen will hatch in nine or ten days. Unless carefully watched this early hatched queen will destroy the remaining cells by gnawing through them near the base, and, when she has made an opening of sufficient size, will deliberately sting the imprisoned queen, the bees finishing the work thus ruthlessly begun. I used quite frequently to find five or more queens in the hatching-box or in the nuclei at one time, and of course many of them would be stung. HOW YOUNG QUEENS MANAGE, WHEN TWO OR MORE HATCH AT ONE TIME. Perhaps my readers are not familiar with queen-rearing, and do not know how the young queens manage affairs when several emerge at the same time. Where several cells are clustered together, as shown in Fig. 7, several of these queens are likely to hatch at the same moment. When this occurs and they meet, a mortal combat ensues; the conqueror coming out of the struggle unharmed, and the other receiving a fatal wound is left unmolested to die, unless some merciless worker seizes her by the wing and attempts to drag her out of the hive. Please remember that worker-bees never destroy a cell that contains a healthy queen. In all my experience I never knew such a thing to occur. Every queen will be permitted to hatch unless attacked by a hostile queen. I am, however, fully aware that many writers state that the workers do destroy them. When breeding by the method just described, I was obliged to spend many sleepless nights watching such cells as they could not be separated, and they would almost invariably hatch at night. The lamp-nursery system has many advocates, but I have never tried this plan as I consider it contrary to natural laws. Cells need the natural warmth of the bees, and it is almost impossible, in the lamp-nursery, to keep the temperature even. Such means will produce poor, weak queens. After long experimenting, I discovered my method as described in this book. With this came a wonderful change. The eggs being of one age when the cells are started, I can accurately determine the time when they will hatch, and they all do so within a few hours of each other, The cells are uniformly built and can be easily separated. By the use of the queen nursery they are hatched by the natural warmth of the bees in the brood-chamber. The fact of knowing just when the queens will hatch, would have saved me hundreds of dollars had I known it when I first engaged in the business. Now I am not obliged to sit up nights to watch the cells and save the hatching queens, and I feel certain that my readers, without one exception, will admit that the above is entirely new, simple, and practicable, and see at once the advantage to be gained by its adoption. If the directions given are strictly followed, no queen need be lost when hatching, as the time can be calculated to within a few hours, as follows: the egg will hatch in three and one-half days after being laid; four and one-half days later the cell will be sealed, and in eight days more the young queens will hatch out, making sixteen days, the time required to rear a queen from the egg just laid. HOW TO REAR A FEW QUEENS. As many bee-keepers desire to rear a few queens for their own use, thus combining pleasure and profit, I will give special directions for so doing. The general rules given in a preceding chapter should be followed, but all operations will necessarily be on a smaller scale. If you wish to rear about a dozen queens, go to a strong colony at sunset, remove the queen, and on the following night take away all the unsealed brood (replacing it with empty combs) which maybe given to some weak colony; then examine all the remaining combs, carefully destroying all cells which have been started. Now give them eggs prepared for cell-building in the manner described on page 12. Mark the date of starting on the hive. 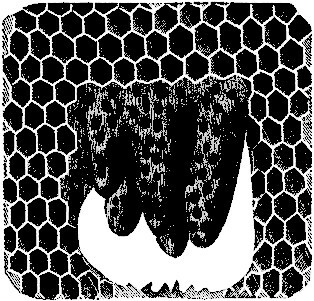 Five or six days later take a three-frame nucleus hive, and place two combs in it; now take the comb on which the cells are started, together with adhering bees from the first hive and place it in the centre of the nucleus hive between the two others; then select several combs of brood from strong stocks, giving them to the colony from which the cells were taken. Next, give them a queen, letting her run in at the entrance and she will be kindly received. Or, in case we wish to rear other queens, remove the bees from another strong colony, replacing them with those that have just completed the lot of cells, giving them the queen just removed and proceed as with the former. It will be necessary to have one of the swarming boxes for the last lot of bees. The above directions apply only to full colonies and standard frames. This also is an important matter to those who rear queens. Great care should be taken in handling combs on which cells are built, as when the cells are not sealed the slightest jar may detach the pupa or nymph from its position and separate it from the jelly-food; and, although the bees may elongate the cells and save the queens, they will be permanently injured, but in most cases of this nature the cells will be destroyed soon after being sealed. The combs should not be handled except when absolutely necessary, and never tip or turn them bottom upward. In no case attempt to shake the bees from the combs, allow them to stand in the sun, or exposed in the cool air until they become chilled. Any rough or careless handling will result in injury to the embryo queens. The wings of the young queens are not perfectly formed until within twenty-four hours of the time they hatch; and if the cells are subjected to such rough treatment, many of the queens will be crippled by having defective wings or legs, or perhaps the abdomen deformed. These precautions apply equally well when cutting out cells. Queens may be hatched from those that have been chilled, but they will be weak and sickly; hence worthless. In changing combs with cells on them from one hive to another, do not brush the bees from them, but let them remain to protect the cells from the extreme changes in the atmosphere. The bees adhering to such combs are kindly received by others under like conditions and circumstances. Queen-cells should never be exposed to the burning rays of the sun as the cell in which the queen is encased is almost air-tight, and such exposure invariably produces suffocation and death. If the temperature in the room where the cells are being prepared for the nursery or nuclei is slightly lower than that of the hives, the cells will not be seriously affected by it, but do not keep them out of the hives longer than is absolutely necessary. REASONS WHY QUEENS FAIL TO LAY, DIE SUDDENLY, OR ARE SUPERSEDED. During the past ten years complaint has been made by some of my customers that queens sent them failed to lay after being introduced. Had these reports originated with unreliable parties, I should not have considered them worthy of notice, but on the contrary the complaints came from customers in whose honor and integrity I have the greatest confidence. This led me to investigate the matter fully, as to whether queens taken from strong colonies while they were in a high state of prolificness and fertility were not more liable to injury in transit. The matter was certainly of sufficient importance to demand thorough investigation. Occasionally, the purchaser would report: "My queen came to hand and was safely introduced, but has not laid an egg up to date." Of course I felt chagrined to hear a report like this from a customer to whom I had sent a tested queen. When dollar queens are sent such a report will not surprise any dealer, as such queens are neither warranted nor tested; the only stipulation regarding them being that they are fertile, and little further is known of them as they are generally shipped as soon as they commence laying. I was well satisfied that if these reports were correct, the injury must have been the result of rough treatment during transit. In order to substantiate my opinion and conclusion, I was obliged to experiment considerably; consequently I removed, on different occasions, several queens from nuclei and full, vigorous colonies, keeping them in the nursery for a few days before shipping, also keeping a correct record of these queens and their destination in order to ascertain if they reported all right. No complaint came regarding them, hence I concluded that I had discovered one of the causes and also the proper remedy for it. The above is not the only reason why queens fail to lay. Unless properly introduced, they will be rendered worthless before they have been in the hive an hour. Sometimes they will be slightly stung, but not sufficiently injured to cause immediate death, although rendered incapable of laying. When the hive is opened the queen is, apparently, kindly received by the bees and successfully introduced, as the marks made by the sting are not always easily recognized. Occasionally they receive a sting in the leg rendering it useless, and such injury is easily recognized. Nevertheless, the queen will continue to lay, but not to the extent that she would had she received kind treatment from the bees when introduced. Sometimes, several weeks will elapse before they show any indications of failing or having been stung, and then are superseded, or as the term is "missing." Parties purchasing queens should not hastily condemn the dealer, but should carefully study the causes of the loss. There are many reasons why queens die suddenly, fail to lay, or are superseded soon after being introduced, the principal of which have been described above with the remedy for the same, and regarding the others I can only say, use caution in introducing them. I would advise the reader (if a dealer) to keep queens "to be shipped," in the nursery for a few days before sending them out. I am satisfied that should this plan be generally adopted, less queens will be lost or injured in shipping. TESTED QUEENS THE STANDARD OF EXCELLENCE. This is an important subject and one of great interest, especially to every honey-producer. Queen-rearing has become a specialty, and honey-producers who wish to rear queens for their own use, and the queen-breeders who desire to infuse new blood to prevent in-and-in breeding want good reliable stock, and in order to obtain this call for tested queens. I think that the importance of the term is often forgotten; some consider that it simply applies to a queen whose worker progeny bear the markings which indicate purity. If so, they mistake, and I think it due to the dignity of queen-rearing and apiculture that this matter be more clearly explained and definitely established. There must be some standard of excellence and I consider that this is implied in the term tested queens. It is not my intention to detract from the value and importance of the business by devising means for producing cheap queens, but to establish a method by which the best may be produced, thereby promoting its interests and worth. If there is one thing more than another which will degrade any business or profession it is trying to produce a cheap article. This invariably leads towards fraud and deception, and results in general injury and loss. Where is the dignity of the mechanic to-day as compared with the past ? This principle of doing cheap work has ruined it, and it is almost impossible to get honest work done by contract. Now with regard to queen-rearing, teach the mass of bee-keepers some way to rear queens cheaply in large quantities, and the country will be flooded with poor and worthless queens. First-class queens cannot be reared and sold for one dollar, and those who expect to get such queens for that price will be disappointed. Tested queens are those bred from the best stock and kept in the apiary until the value of their progeny regarding honey-gathering and purity has been thoroughly determined; and no queen should be shipped as tested until the above mentioned requirements have been complied with. All tested queens should be graded, the best being selected tested. I have such an one in my apiary for which I should refuse one hundred dollars. Selected queens are those which give promise of being perfect in all respects before being tested. When I open a nucleus hive and find a large, handsome and prolific queen, one that is putting the eggs in every cell in exactly the same position, I mark her either selected or for testing; and if she is shipped before she has been kept long enough to test her progeny she is called a selected queen. Such queens (all things considered) are the cheapest in the end for bee-keepers generally. My apiaries are so located and arranged that very few of the queens will mismate; hence most of the queens, sent out as warranted, prove to be purely mated; they are reared from the best stock and just as carefully as the tested ones. The chances are that the purchaser will be well satisfied with the warranted queens, especially if he be a honey-producer, although I consider the tested queens far preferable for those who wish to breed queens. As before stated, I regard the production and sale of dollar queens (so called) an injury to apiculture and its interests. I do not rear such, have none for sale, and advise the reader never to purchase them of any dealer. When nuclei are kept in the same yard with full colonies there will always be more or less robbing during scarcity of forage, especially when feeding is resorted to; and any apiarist who has once experienced wholesale robbing in his apiary will never forget it. To prevent this, feed only white sugar syrup as there is no "enticing scent" to such plain, simple food. Clear honey cannot be safely fed, no matter how much precaution is taken, and should not be used even though the honey costs nothing and sugar fifteen cents per pound. I know of nothing more discouraging to the queen-dealer (unless it be unfavorable weather) than upon examining his bees to find the strong colonies robbing their weaker neighbors; and as it is not easily controlled when once commenced, every means should be used to prevent it, as " an ounce of prevention is worth a pound of cure." There are, however, times when we shall find the bees robbing in spite of all our precaution; and there are several plans either of which may be resorted to in such cases, and unless this is done every nucleus in the apiary will be ruined in a short time. When a colony is being robbed, close the entrance at once to keep the robbers in the hive from coming out and others from entering. After giving the robbers confined sufficient time to fill their sacs, release them sprinkling them with flour as they leave the hive and trace them to their home. The hive being robbed should be closed and opened repeatedly until all the robbers have vacated. Then give the robbing colony a dose of tobacco smoke, which will soon stop their marauding (for a while at least), and when they have nearly all returned to the hive close it for a time with one of the screens, Fig. 12, page 34 (described at end of volume), thereby checking and preventing further robbing. If the hive being robbed is queenless and reduced in numbers, it should be removed to the stand occupied by a stronger one (also queenless), thus equalizing them. I find this method of equalizing nuclei a good one, even when there is no robbing. The entrances of the hives should be protected with a piece of glass (four or more inches (10cm) long and one inch (2.5cm) wide) placed against them in such a way that the bees can pass out at either end, and secured against the hive with two small tacks. If robbery is being carried on to any great extent, one end may be closed with a piece of paper; and if the robbers are still persistent, throw some grass against the glass in such a way as completely to cover the entrance. The bees belonging to this colony will find their way in or out of the hive, while the robbers hesitate before forcing their way through this barricade; and if they should attempt it, their chances of escape are few, for it is not an easy matter for them to find their way out again, and the colony thus assailed takes courage, while the sentinel bees, with renewed vigor, seize upon the intruders as they enter, stinging them before they can escape, often defeating them. The glass placed against the entrance in no way interferes with the queen or bees when they wish to pass out or in. When feeding nuclei, great care should be taken that the feeders do not leak, and that they are properly filled. If any syrup or honey is spilled upon the ground, cover it with earth so deeply that the bees will not discover it. One of the greatest and most troublesome pests of the apiary (especially to queen-breeders) are the fertile workers. They are generally produced by allowing a colony to remain queenless for a long time, appearing sooner in nuclei than in full colonies. Their presence is known by drone-brood in worker cells. Drones reared from these eggs are invariably dwarfed, and, in my opinion, incapable of fertilizing queens. It is quite difficult to introduce virgin queens to such colonies, although a cell may be safely given them at any time. The remedy is this: place a frame of well matured worker-brood in the centre of the brood-nest, and in a few days give them a well matured queen-cell, and by the time that the brood is all hatched the fertile-workers will be gone. When you think a colony is infested with them, examine the combs, and if the eggs are laid in a careless manner, two, three, and often more in a cell, with many cells passed by, and the brood when capped projects beyond the worker-cells, you may be sure that it is some of their work. It would be well to destroy all such brood before giving the colony a queen-cell. Do not destroy the combs but rather shave the heads off with a sharp knife.